We are proud to be an authorized retailer for Wright Manufacturing Grass Gobblers. 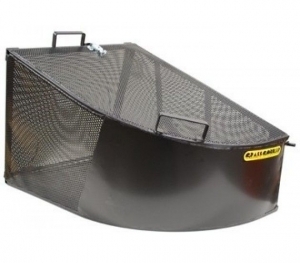 These grass catchers fit a variety of Exmark commercial mowers. Utilizing durable steel construction for season after season of use. Not all grass catchers are built the same! Wright’s unique design allows for continuous air flow and high-density packing. Cut longer with less frequent stopping with Wright’s Grass Gobblers. Available in a variety of sizes. Check out the specific units we carry below. The GGJ50 from Wright Manufacturing is the larger of their grass catchers. Holds approximately 4.3 cubic ft. of material. Weighs approximately 23 lbs. Fits most Exmark commercial mowers. Wright Manufacturing’s GG450 is the regular size version of their high quality grass catcher. Holds approximately 3.3 cubic feet of material. Measures approximately 16″ wide by 20″ tall. The smaller unit weighs approximately 20 lbs. Fits most Exmark commercial mowers.